Are You Using Your Cooling System As Efficiently As Possible? The short answer to this is, “yes.” Your air conditioner simply cannot function as efficiently and effectively as it is meant to if the internal components are dirty. This starts, of course, with changing your air filter. No, that air filter—which comes standard with your HVAC system upon installation—is in place to protect the inside components of your system from dirt, debris, and other contaminants that can impact AC performance. You should be changing your air filter every 1-3 months during periods of use—the more contaminants in the home the more often it should be changed (for instance, pet dander and cigarette smoke are both considered contaminants). When we’re talking about your air conditioner’s internal components, we’re mainly referring to its coils. 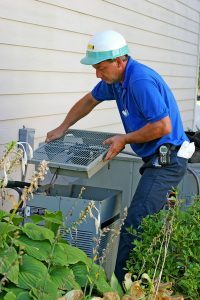 There are two in the cooling system—the evaporator coil located within your home inside the air handler unit, and the condenser coil located outdoors in the condenser unit. If either of these coils is caked up with too much dirt or debris, you can have some major problems heading your way. What Do These Coils Do? What many homeowners don’t really understand about air conditioners is exactly how they work. They may imagine that a cooling system creates cool air, but this just isn’t possible. Your air conditioner removes heat from the air inside your home, disperses that heat outdoors, and recirculates cool air provided by the coils, throughout your home. This entire process is dependent on the completion of the refrigerant cycle, which relies on the coils! The evaporator coil is where the refrigerant evaporates into gas form. This allows the refrigerant and the coil to draw heat out of the air passing over the coil. Then, the refrigerant travels out to the condenser unit, where the condenser coil and the fins of the unit help dissipate the heat. Then, the cycle restarts until the desired temperature is met and maintained in your living space. The heat transfer process suffers if these coils are too dirty. For instance, is the evaporator is too dirty, the AC system will struggle to draw an appropriate amount of heat out of the air, leaving the AC working overtime in order to cool your home, increasing wear and tear on the system (not to mention increasing your cooling costs) while your home comfort decreases. The evaporator coil itself can also get too cold, causing condensation collected upon it to freeze up. This layer of ice further complicates the issue. If the condenser coil is dirty—potentially covered with grass clippings from mowing the lawn or surrounded by dead leaves/fallen branches, etc.—then it’s going to struggle to release heat into the air surrounding the unit. Some effort is already required when the outside air is hot to begin with, so a dirty condenser coil makes things harder than necessary for the system. The good news is, cleaning your AC is a main part of professional maintenance. So if you’re worried about the condition and cleanliness of your cooling system, just be sure to stay on top of your annual maintenance sessions! Contact IERNA’s Heating & Cooling today for exceptional Tampa air conditioning services.